Postcard US-2651107 to Taiwan was initially one of the Year of the Snake maxi cards enclosed in an envelop with the Year of the Horse Forever stamps. 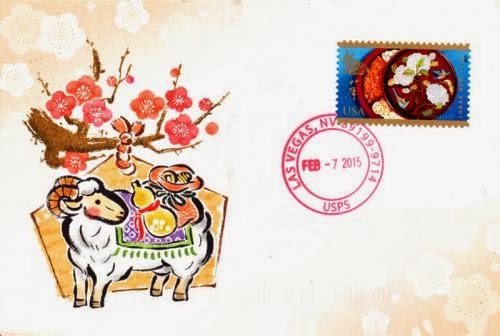 The envelop was sent in with other the Year of the Horse cards for a first-day-of-issue postmark in early 2014. The envelop seemed to be lost in the mail. This the Year of the Ram maxi card was sent as a replacement on February 7, 2015 when the Year of the Ram Forever stamp was first issued. It finally arrived two days before it would have expired permanently after "traveling" for a full year.